Picnicking is an elegant affair with the Windsor traditional English-style picnic basket. 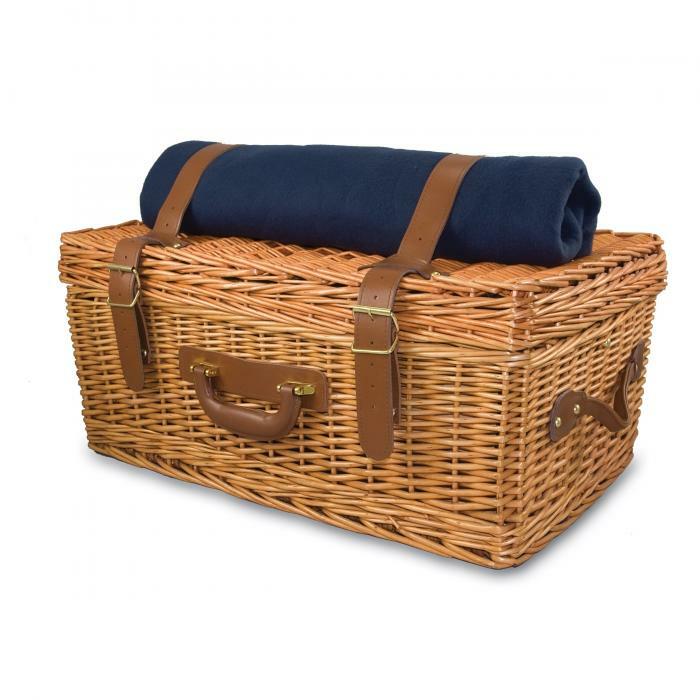 The Windsor is a suitcase-style willow basket with genuine leather straps, plush corduroy interior, and deluxe picnic and coffee service for four. • Dimensions: 23.5" x 14.5" x 11"
This basket is great! Big enough for a family of four, the dishes, glasses and stainless steel all are good quality. The only drawback is that there are only 2 small containers to hold actual food! There is enough space to put maybe 1 additional small container and some Ziplock bags so you can get enough in with clever packing. However, I might need to carry another bag if we were planning a full meal. I still would buy this one again and am very happy with it! 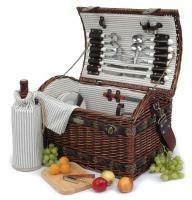 All the pieces included, napkins, and wicker are very nice and worth the price. It has exceeded my expectations! I purchased it as a gift, and I am very pleased! It is very posh. 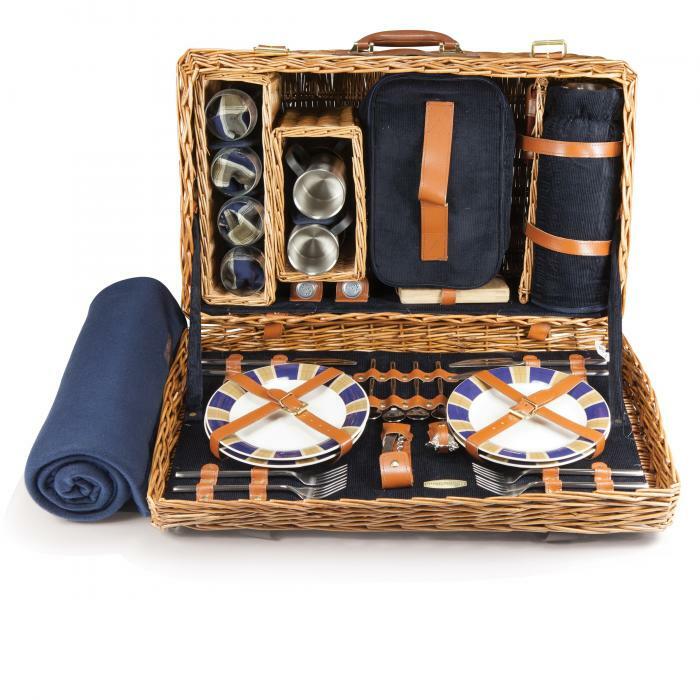 I love the porcelain plates and it includes everything you need for a great picnic! 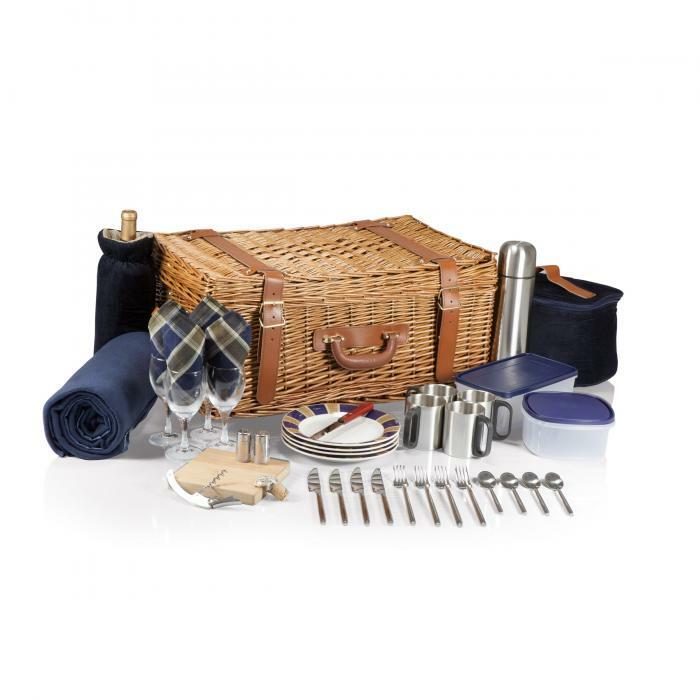 This is a superb picnic basket. It is substantial in heft, thoughtful in content, and of undeniable quality that yields serious results - a delight to use, it invites and entices more picnics with the result being a a sumptuous coming together of good friends, good food and natural beauty -- highly recommended!!! It is an elegant basket beautifully laid out and presented. It will provide years of pleasure for the receiver, I am sure. It was a retirement gift and was very well received. It is a very nice product. A bit larger than I had expected. 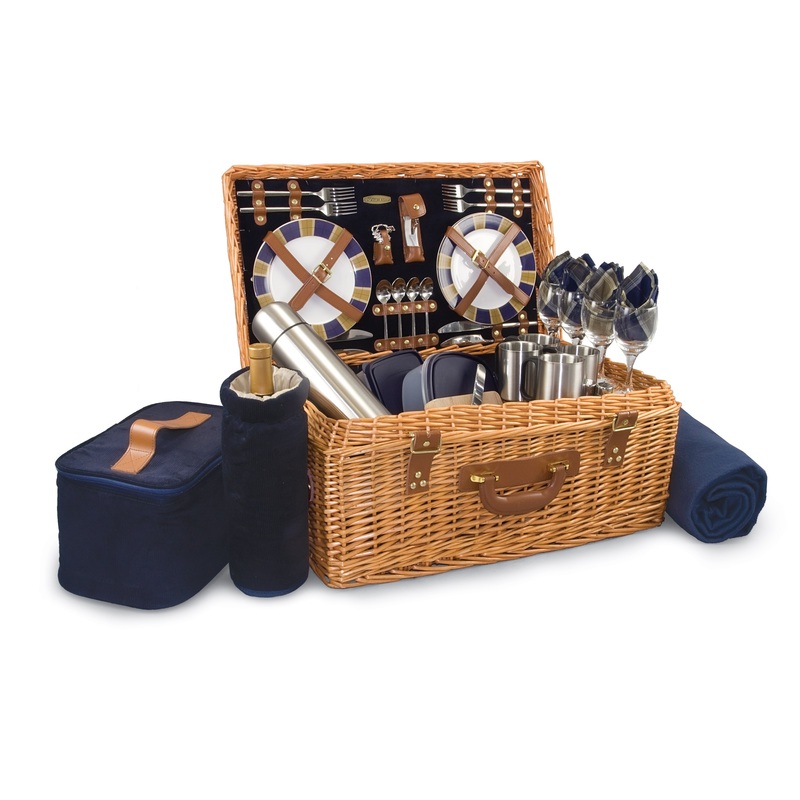 I am looking forward to summer and fall picnics with friends. Door Prize Entrants at Professional Medical Conference coveted it and the Recipient loved it! First Class gift at excellent price. I referred several participants & employees to your web site. Thanks for making me look good as a man who should rarely pick a gift for a predominatly female audience. Great overall shopping experience. One mishap involving a broken wine glass occurred in transit, but you worked very quickly to resolve. Ultimately four new wine glasses were sent along for the inconvenience. Great products and even better customer service, which is sometimes the most important thing. I plan to shop with you again and highly recommend to friends and family. Many compliments at a concert picnic I went to. Would have liked larger wine glasses and larger spoons. It was very nicely put together. I gave it away as a gift and they loved it. 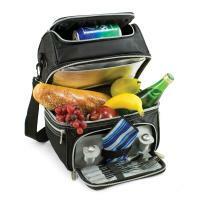 I must say that this site has a wide variety and seemingly quality products to pick from. I thought the contents that were included in my basket were fantastic but the overall quality of the construction of my picnic bag to me leaves a lot to be desired. The bag itself feels flimsy and the fit and finish of the product is not the best. I had to line up the top with the bottom and had to manipulate it in order to get the lid to fit on the base. The leather straps I feel could also be more substantial. 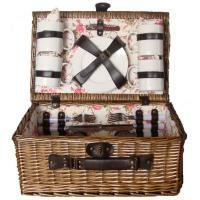 Maybe it's me I just like a sturdy picnic basket that looks like it will last for many years. I don't have that feeling with this one. •4 wine glasses: 8 oz. •4 Cotton Napkins: 14" x 14"